1- Orbitz gum (missing from picture - $1.39 ) used free item coupon from facebook = FREE! 1 Box Quaker Chewy Bars ($3.37) used $3/1 facebook coupon = $ .37 cents! Marcal 1000 sheet toilet paper ($.89) used free coupon from last weeks SS = FREE! 2 Boxes Sani-Hands Sanitizers (sale price $1.00 ea) used free coupon from last weeks SS = FREE! 1 packge of Chips Ahoy Cookies ($2.50) used $2.50 Facebook coupon = FREE! 1 Lean Cusine ($3.85) used $4/1 facebook coupon (FBC) = -15 cents! 1 Tyson Chicken Nuggets ($6.99) used $6/1 FBC coupon = 99 cents! 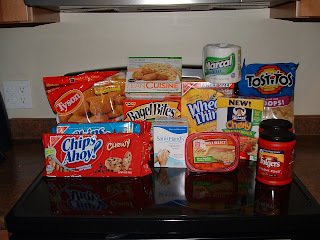 1 Box of Wheat Thins ($4.69) used free WYB 3 Kraft Products = FREE! 2 packages of Chips Ahoy Cookies ($2.50) used $2.50 Facebook coupon = FREE! Hillshire Farm Deli Meat ($4.15) used $4/1 FBC = 15 cents! Total after coupons =$ .94 cents!!!! These deals are awesome, Lindsay! Hey, do you have any idea what's up with your feed? It stopped updating after August 4th and I can't seem to subscribe to your blog anymore. Why did you need to do two transactions? I didn't have to do transactions- I just had two stores within a mile of each other and I didn't want the cashiers to give me a hard time. (Which of course, one of them did!) GRR. The price we pay for free things.